Here are some of my favorite looks for a black tie event to a casual dinner party. In general, people don’t take the time to dress up anymore. Things have become so casual – too casual in my opinion. I love getting all dressed up. I often think I was born in the wrong era, as you can see by my outfit above. 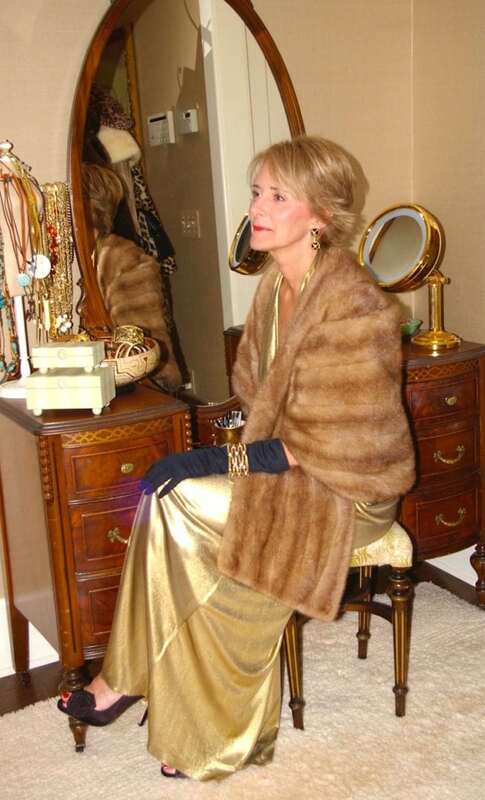 Note the vintage fur stole and long, black evening gloves. One of my favorite dressy looks is my black tuxedo suit. It’s always chic, no matter what you pair with it. Every girl should own one! If you don’t want to dress up, why not add something festive and fun to your look, like this green satin top with gem embellishments and leopard pumps? Or a colorful, sheer duster with a gold embroidered velvet tie? 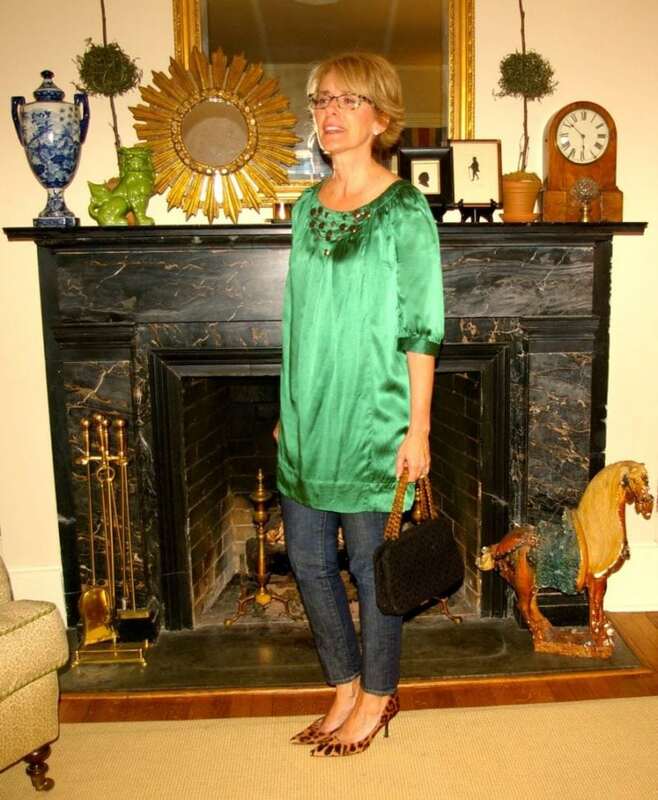 Or what about embracing a more casual, festive look with a tee shirt and purple velvet shoes? I hope to “Jingle All The Way” through the holidays, bringing a little lightheartedness and cheer to myself and everyone around me. There’s so much to celebrate, and adding “Jingle” helps remind me of that. I was in ZARA and HM yesterday and thought of YOU!I saw those GLOVE BOOTS!!!!! !NOT CHEAP! ZARA had some GREAT LOOKING SHOES!I thought to MYSELF CHERIE would LOVE THOSE and I had THAT thought a few times! I think CALIFORNIA is probably the worst for DRESSING UP! Well, you ROCK the SEASON……….hope you have a FEW PARTIES to ATTEND! BE SURE to SEE BRENDA WELCH over on my BLOG THIS WEEK! Thank you! 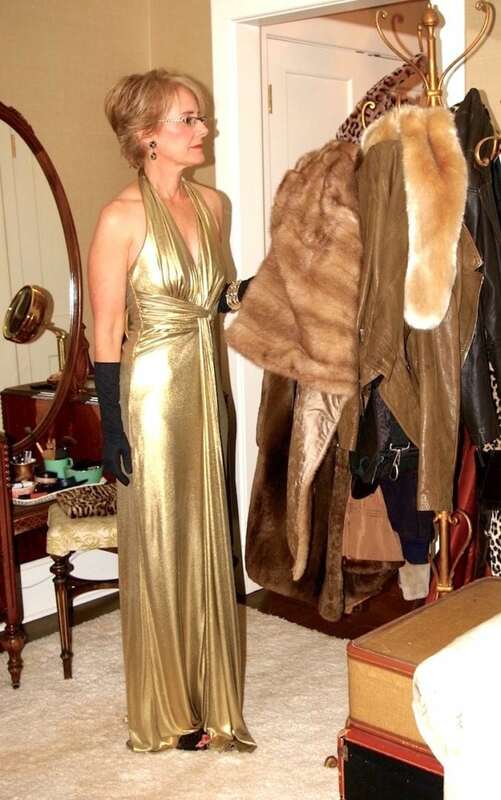 I was in my closet this afternoon, looking for a jingly outfit. Got sidetracked and heartbroken when I discovered the moths had gotten to a sweater dress I LOVE!! Other than moth balls… ugh, cedar planks and lavender don’t seem to work. Any ideas? I wish I did Brenda, but I don’t. I have lost many a loved sweater to the pesky things!